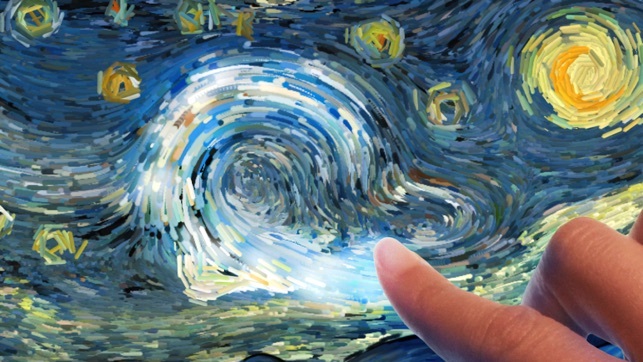 Watch the iconic flows of Vincent Van Gogh's "Starry Night" come to life, in a hypnotic animation! 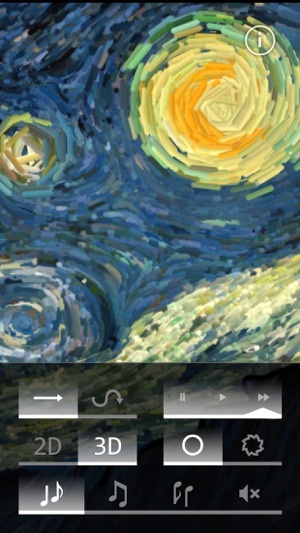 Drive the flows with your hand to create your own variation of the original painting! Dive in the landscape with immersive 3D zoom! 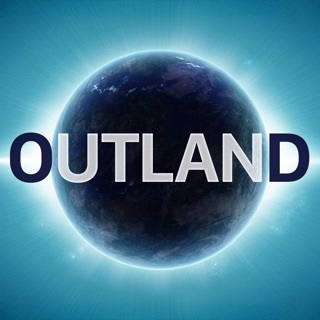 Listen to the background ambient music, which is also responsive. Have an enchanting experience and re-discover a classic masterpiece. "Very cool! 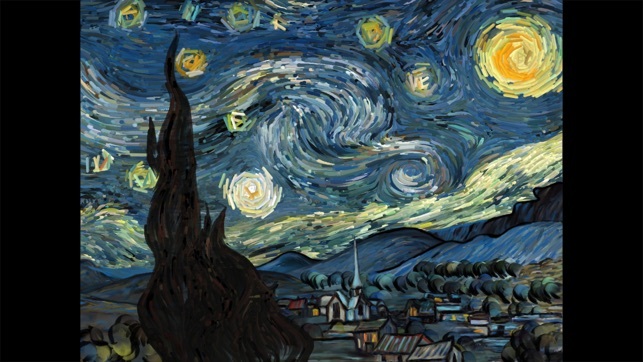 An interactive animation of van Gogh's 'The Starry Night'." "Imagine being Vincent Van Gogh. Imagine giving form to 'Starry Night' with your hands. ... Playing the artist instead of the observer is now possible. ... As the viewer drags his finger across the painting, the dashed oil lines react, creating a river-like effect of blues and golds over the night sky. 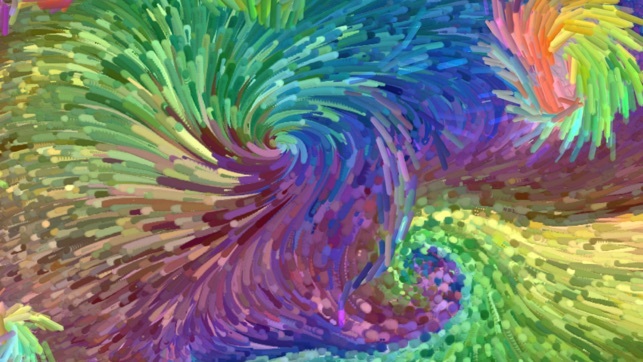 With each brushstroke movement, a soft note of ambient music rings out as well. The work that went into creating such an elaborate piece of art is impressive. Vrellis took a piece with a seemingly unsurpassable amount of artistic merit, and breathed new life into it." "We find Vrellis' interactive piece enchanting - and even, given Van Gogh's tragic story, emotionally powerful." 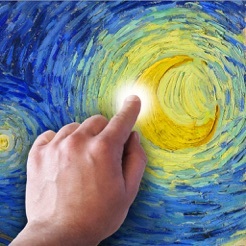 "Van Gogh's Starry Night modded into beautiful interactive light and sound show. …This is one of those little projects you wish you could just play with the second you've seen it." "The effect is so beautiful and mesmerising." "Beauty through simplicity at its finest and most playful." "A very fascinating version of ‘Starry Night’... The result is stunning!" "Designer Petros Vrellis adds a whole new dimension with his animated and interactive version of the painting." "The results, which also have a musical soundtrack, are quite stunning." 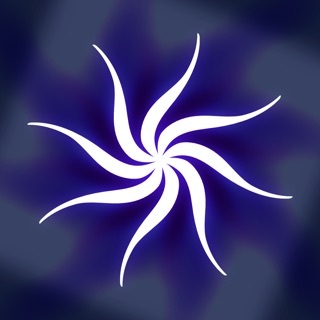 "This app can function as a lovely example of new possibilities. It's so impressive, allowing everyone to feel like Van Gogh for a few moments." "If Vincent had the tools that we have today, this is the work that he would have created." "Utterly beautiful to look at and interact with ... positively delightful, both peaceful and wondrous with a similarly attractive musical score. ... 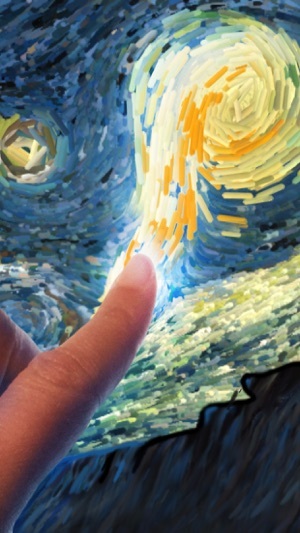 Using a finger to ripple through the artwork is a mesmerising experience. ... It makes art accessible for the masses and brings it to life for children." "With hypnotic relaxing visuals and audio, 'Starry Night’ is our new favorite thing to play with on a rainy Sunday afternoon. ... It is hard to describe what a wonderfully immersive experience it is getting hands-on with an art piece like this, you just have to have a go." For best iPad experience, disable "Multitasking Gestures". - The app is optimized for iPhone5. Just zoom in (with 'long-press') to make the painting fill the whole screen. - The app runs smoothly on iPad2, iPad mini, iPhone4s, iPod5 and newer devices. - The app is NOT RECOMMENDED for iPhone4 and iPod4. - The app is not available for iPad1, iPhone3GS, iPod3 and older devices. These devices are excluded by the “front-facing-camera” requirement. The app itself is not using the camera at all. Жаль что картина всего одна. Как вернуть картину в исходное изображение??? Не пойму как вернуть изображение в оригинал?? Приложение, созданное по великой картине Ван Гога позволяющее расслабиться и порелаксироввть.